Kapil and Ginni hosted a fun filled musical evening for their family and friends. 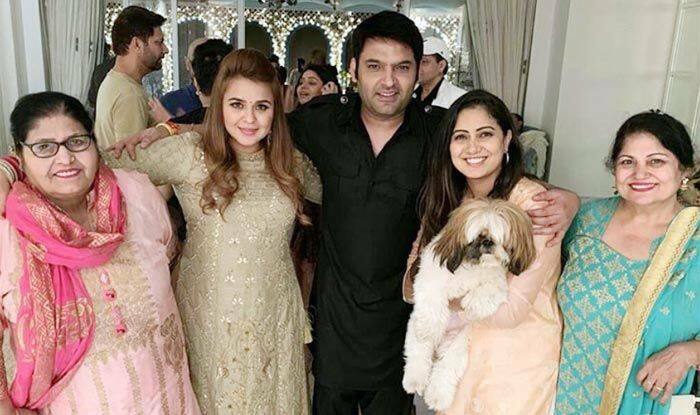 Newlyweds Kapil Sharma and Ginni Chatrath hosted a fun filled musical evening for their family and friends, and from pictures and videos that have emerged it looked like one epic party. A number of their friends from the entertainment industry were in attendance and among them were Mika Singh, Shaan, Sukhwinder Singh, Anu Malik, Vishal Dadlani, Sunidhi Chauhan, Raghav Sachar and many others. Punjabi singer Jaspinder Narula told the Mumbai Mirror that the party was an impromptu plan, and with it being a gathering of singers, all they did was sing. “It was an impromptu plan and what would a gathering of musicians do except sing and play music! All of us wanted to listen to each other sing so we had some small performances which began with Sukhiji (Sukhwinder Singh) crooning his private bandishein,” Jaspinder was quoted as saying. On the work front, Kapil is back with his show The Kapil Sharma Show, which is steadily climbing up the charts.